Superior motocross technology for sand and mud. The M102 lets you take off-road riding to the next level, powering through sand and mud like never before. 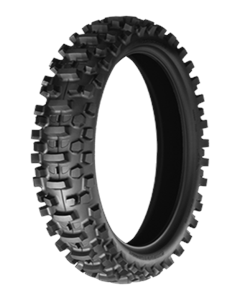 The M102 tyre offers incredible traction even in the softest terrain. Newly developed stabilizer blocks effortlessly cut through sand and mud like fins on a surfboard. Optimized block height retains efficient self-cleaning. Developed during several seasons of Motocross Gran Prix. Advanced tread design boosts straight-line and cornering performance even further by limiting unwanted lateral momentum. Superior traction and contact feel means more line choices and more flexible performance on the track.